"Bags of Rock" probably aren't of much interest to most people. For Upland Rangers however they can be something to get excited about! At this time of year we are getting ready to return to the fells to start upland path projects. The bags in question are the ones we fill with rock to be moved by helicopter to the project sites. The first stage of the process starts before the bag filling commences as it needs to be agreed where the rock can be collected from. Wherever possible we use rock local to the area so that it is consistent with the surrounding landscape. Nearby screes are a good starting point for potential locations. These have to be agreed with Natural England, a public body responsible for protecting and improving England's natural environment. There may be reasons a scree should not be used, such as rare or protected flora, and there may be limits on how much rock can be taken. For example during the current rock collection we are avoiding areas of woolly hair moss. Once the sites are agreed we can start bagging up the rock although we need to first get the 'heli-bags' to site. This means carrying around 10 bags per person up to the rock sites. Our main project this year is a joint one with the Western team, tackling erosion on the path from Red Tarn to Crinkle Crags. The rock sites selected are between Crinkle Crags and Cold Pike and our walk up from the Three Shires stone is around an hour. A fairly good warm up before the 'main event' of bag filling! Once we arrive at the rock site with the bags a quick break is in order before the bag filling commences. There are various things to consider when filling the heli-bags with rock. This might include finding a nice spot to place the bag close to some suitable rock. The size and shape of the rock needed depends on what you want it for, such as stone 'pitching', drainage or landscaping work. Most of the rock recently collected is for stepped stone 'pitched' path work. This means chunky rocks with a bit of depth and a fairly flat surface that people can plant their feet on are in demand. It can be quite challenging rolling the rocks into the bags especially if it is windy the bag is flapping around. First rock of the day - a nice pitching stone "in the bag"
The heli-bags are designed to carry a ton of rock which is the limit that the helicopter can usually carry in one go. In reality the filled bags tend to weigh around 700 to 800kg. The number of bags that can be filled per person in a day can vary widely depending on the site, the type of rock needed and how accessible the rocks are. The author of this blog likes the challenge of filling all of the bags he carries up but has only managed this once this year. There are legendary tales from the past of path workers filling impressive numbers of bags in a single day. Bag filling can be quite a gruelling task but is satisfying and a great work-out. Searching for particular shapes and sizes of rock can have side effects and you may find yourself noticing suitable rocks wherever you go. You can even find yourself strangely attracted to rocks and describing them as 'beautiful'. It is fair to say that this trait may not be appreciated by others, particularly friends and family when not at work. After spending the winter doing mostly lower level work it is a great feeling returning to the fells to focus on the upland work that we enjoy. "How do I get myself into these situations ? " I ask my wife, whose opinion I value and whose comments normally , and quite annoyingly, get directly to the heart of an issue . " Because you’re an idiot" she replies with a look of exasperation , one that you might give to your pet dog after it has swallowed a whole j cloth which had some peanut butter smeared on one corner. I fear that she may be right, but I am certain that this is not the only reason I find myself in this predicament. Our new neighbours moved in just before Christmas. Colin is about 15 years younger than me and is an Outdoor Education instructor . Unfortunately for me he now does the same commute into work that I’ve been doing for the last couple of years and what ‘s worse is he sets off on his bike at about the same time. Last Monday I set off a bit before Colin and he overtook me half way there, we exchanged pleasantries and agreed it would be great if the rain held off until we both got into work . As he passed me, I picked up my pace a bit but struggled to keep up with him on the hill. The following day I again set off ahead of him and was definitely peddling just that little bit faster knowing he was behind me , I was puffing and blowing a bit on the hills and I’d be lying if I said I wasn’t a bit disappointed that he passed me again , me red faced and grimacing , he chatting amiably , not out of breath , hardly having broken sweat ! The view I should have been enjoying if I wasn't sweating blood. Now I’m not an overly competitive person normally , if I’m playing Trivial Pursuits I am quite happy to lose as long as we have had some fun along the way. Last Friday I again set off slightly ahead and something inside got the better of me and I went straight into racing speed , I became Sir Chris Hoy,feeling that I couldn’t face the humiliation of being overtaken for a third time that week I was out of the saddle on the hills ,muscles burning, heart thumping, the taste of blood in my mouth ( must see the doctor about that ). Of course I was doing my best to make it look like I wasn’t racing ; trying to look around at the scenery in a casual manner when really I was peddling at top speed and trying to check if I could see Colin 's front light behind me . When I reached Hawkshead I saw a light behind , thinking it was the ' silent assassin' I peddled even faster waiting for the inevitable wave as Colin passed me by. Miraculously it didn’t happen and I made it into work without being overtaken . My pride and self worth fully in tact , I did it in record time .......and it very nearly killed me , I needed to lie down for a few hours to recover . Any sense of relief was short lived as it dawned on me that I was going to have to do it again next Mon , next week and every week until one of us ( probably me ) dies of a stroke or gets another job. And how did I get into this situation because I'm an idiot well yes that's certainly part of the answer, but also I feel that I may be a victim of evolution. Competition within species is a fact of life and is particularly apparent at this time of year. During the spring, the males of many species are establishing and protecting their territories and then trying to attract a mate. Being the strongest, the fastest and the most colourful all helps. The older males each year have to prove that they have still got what it takes. Blackbirds and Robins are familiar birds in our gardens but fiercely territorial , Blackbirds will go to great lengths to protect a single tree laden with berries, providing food during the winter, using elaborate calls and flight patterns, to let other birds know that this their territory. 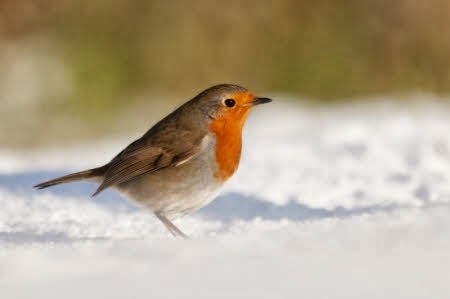 Robins despite their cute and friendly image , will become particularly aggressive if they feel their patch is being intruded upon by another robin , other than a mate. Cute garden visitor or vicious thug ? If you take a walk along the side of Lake Windermere , you will almost certainly see Canada geese protecting their nesting sites on the islands with loud ‘honking’ and aggressive wing flapping. 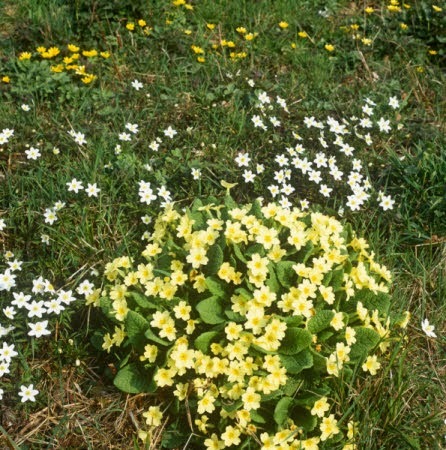 At this time of year the procession of late winter/ spring flowers has started , the white snowdrops have given way to the daffodils and the wild garlic is pushing through to be followed by the lesser celandine , wood anemone and primrose . All these plants flower early in the spring to avoid competition with other species and to make the most of the light before the canopy closes as the trees come into leaf. If you are looking for a great place to enjoy these and other early signs of spring , why not take a walk around Tarn Hows near Coniston or along the West shore of Windermere to Wray Castle in thernext few weeks . Keep an eye out for the sweaty red faced idiot on the bike, and show some pity , he’s just trying to prove he's still got it, he's a product/victim of the evolutionary process. The man from the MCA (Maritime and Coastguard Agency) came to carry out a heel test on Gondola last week. The test aims to determine how Gondola tilts or ‘heels’ with changes in weight distribution, as would happen if all the passengers suddenly decide to move to one side of the boat. Obviously, we don’t carry out the test with real passengers. We have to replicate the weight of each passenger with barrels of water. Here’s a picture of us filling the first few barrels. Gondola is licensed to carry 86 passengers. Each passenger is represented in the test by three 25 litre barrels of water, so that meant filling 268 twenty-five litre barrels! You have to take your time otherwise there's water everywhere - throw in a couple of giant foam rubber costumes and it would be like ‘It’s A Knockout’. The barrels are distributed around the boat where the passengers normally sit. It took a while to wheel, drag and carry all 268 barrels into place. After a while, with all hands to the pumps, we managed to get all the barrels into position. Here is the forward saloon seating area, chock-a-block with barrels ready for the test to start. The man from the MCA, let’s call him Ian (because that was his name), then began taking his measurements around the boat with the help of crewman Scott. Measurements were taken with a balanced load and then we went through the arduous process of shifting barrels again, this time from one side of the boat to the other to determine the tilt of the boat with the weight mainly on the starboard side. You can see from the balanced load (left) and unbalanced load (right) below that the boat does heel slightly, but not by much. As the final measurements were taken, we all waited to see if Gondola had passed the test. I’m pleased to say that the Man from the MCA, like the Man from Del Monte, he say ‘Yes’! We have one more test to carry out before Gondola goes back on the water - the ‘man overboard’ test. This year we figured we’d go for greater realism and seek a volunteer for the job. One of our crewmen, Dave (the Davina McCall of the crew), recently and somewhat briefly, experimented with open water swimming, so we thought we’d ask him to volunteer. Unfortunately, my hearing isn’t what it used to be, but I’m fairly sure he answered in the negative. I guess we’ll just have to use a dummy as we always do. Stylish New Gates?....Improving the access to Windermere's scenic North East shore at Jenkyn's Field. Jenkyn's (also known as Jenkins) Field is situated on the North East shore of Windermere and is only a few minutes walk from the busy tourist area of Waterhead. Snow covered Langdale Pikes in March ......viewed from the Northern end of Jenkyn's Field. Canoeists heading out from Jenkyn's Field. Jenkyn's Field has gently sloping beaches, and is well worth a visit for the wonderful views across the lake. Archie and Missie, with their well trained owner! It is also an ideal place for a gentle walk, or a picnic and in warmer weather it is a popular base for swimmers. Great North Swim. 2011. Viewed from Jenkyn's Field. Many people watch the huge annual summer event - The Great North Swim - from here. C'mon and Swim to The Beat. (5) Skim a stone, (12) Make a trail with sticks or, as illustrated, (14) Dam a stream. The step stiles at either end of the field were replaced with gates in March 2014, making access to the permissive footpath much easier now. The work was undertaken by rangers based at St Catherine's with funding from Go Lakes. The wooden step stile at the Southern end of Jenkyn's Field before removal. James, Area Ranger, getting serious with a "wrecking bar!". the impressive old limestone gate stoops to be brought back into use again. What a difference! The new gate and steps. Much more inviting. So much easier to use. Approaching the gate into Jenkyns Field. Acres of space. Quite a contrast with the busy A591 to the right. As one walker put it. "This is such an easy place to get to...to get away from it all!" For the more adventurous, there is a route around the rocky outcrop at Jenkyn's Field. The stone step stile at the northern end. Narrow, awkward and not a very inviting access. ...and replaced by a 4 foot gate and a stone step. Big improvement. Where to go to next? Stagshaw Gardens and "The Tall Tree Trail" overlook Jenkyn's Field and are within easy reach. Champion trees include the tallest Grand Fir in England; it is also the tallest tree in Cumbria. 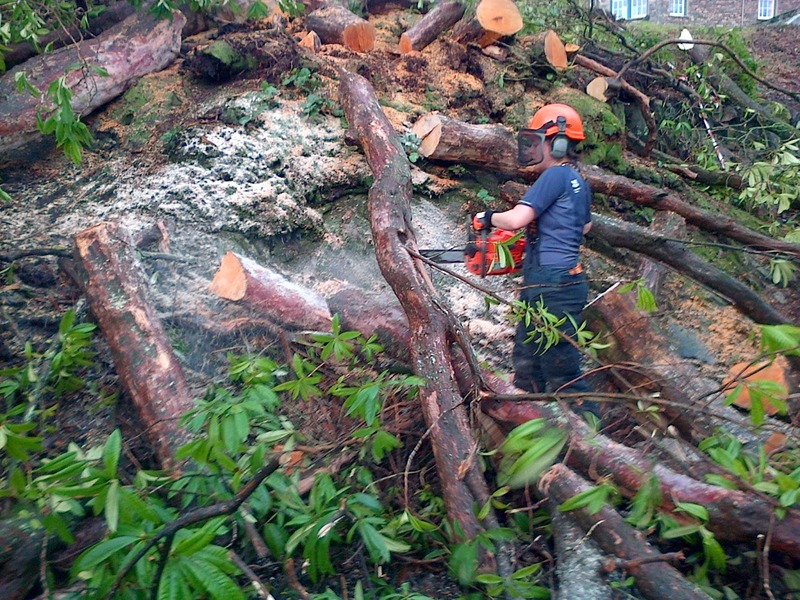 See post: "Champion Trees of Ambleside." The trail starts near the Stagshaw Garden's car park. High Close Estate was left to the National Trust in 1951 and the house was leased to the Youth Hostel Association shortly afterwards. There would have once been nine gardeners employed to maintain the grounds at High Close, however much of the garden has been in disrepair for many years. 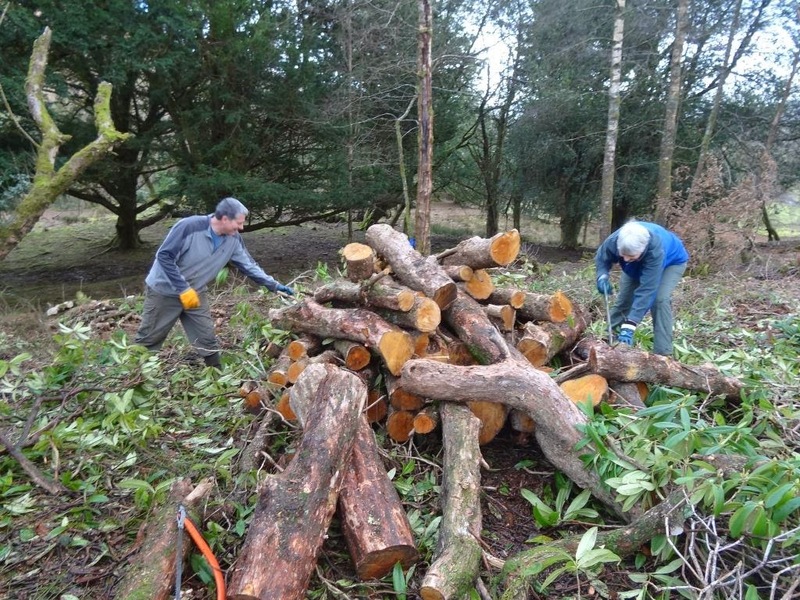 Volunteers have taken ownership of the garden and begun work to clear back areas of rhododendron and reinstate the network of paths through the gardens. After a break over the Christmas period, our volunteers have returned to High Close to continue their work. 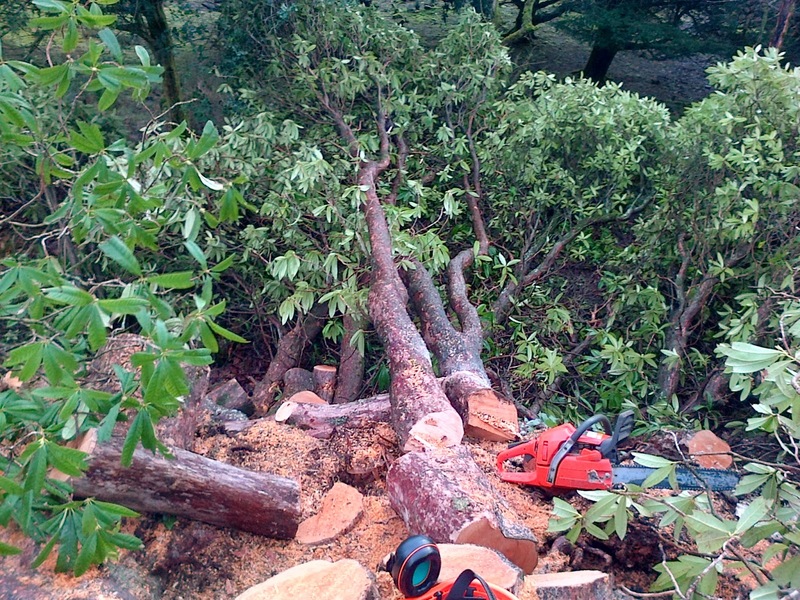 The gardens were subject to the high winds over the last couple of months which has seen the loss of one of our large Rhododendrons. The foresters winched the large root plate back into position and the ranger team cut the remaining stems and brash up to clear the pathway. 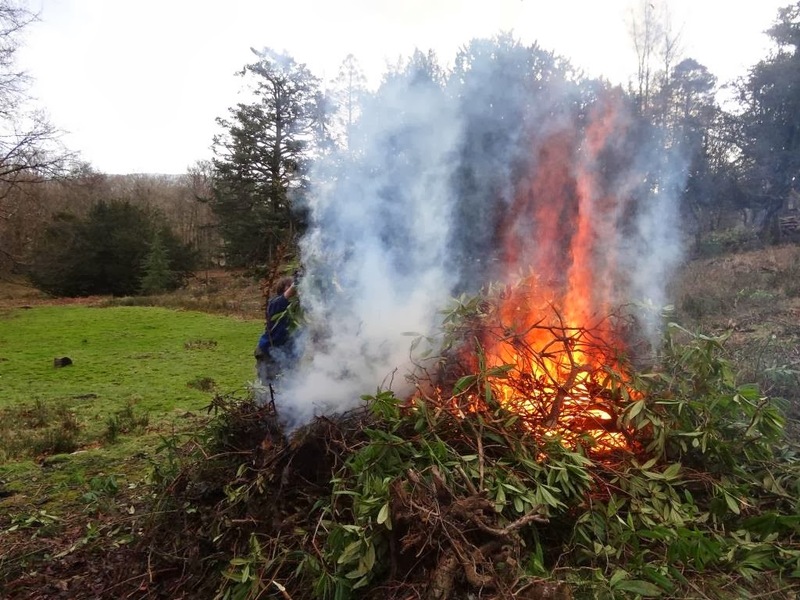 The hard work was left to the volunteer group who dragged and burned all the brash to make the site tidy. They have also begun work clearing and preparing the ground for seeding on the banking below the view point. If you are interested in volunteering we are currently advertising for a Volunteer Coordinator for Grasmere and Great Langdale, to help us increase our volunteer numbers so we can continue the great work already started at High Close as well as working on new projects. Thousands of people come each year to visit our stunning beach but we need to make sure we keep it this way. Threats from pollution in the sea, litter and dog poo can all hinder your enjoyment and damage habitats and kill wildlife. A European Directive coming into effect from 2015 will mean that higher standards of water quality will need to be met in order for our water to be safe for swimming and paddling. By working together with businesses, farmers, visitors, Town and Parish Councils and volunteers we want to exceed these required standards by 2015. We kicked off our membership of LoveMyBeach with a good old beach clean, which attracted 12 people who collected 320kg of litter. I’ve been working recently in the gardens of a rather splendid holiday property owned by the National Trust. 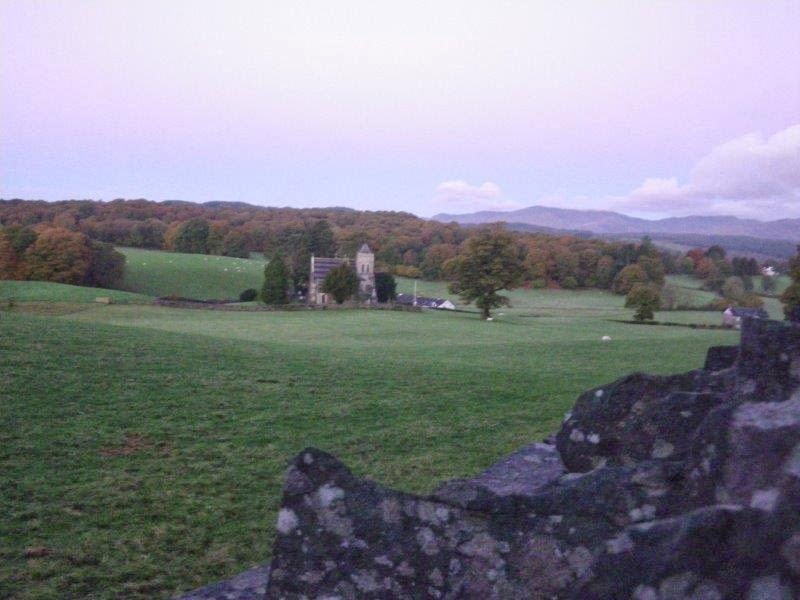 Millbeck Towers is near Applethwaite at the foot of Skiddaw. It has beautiful, large gardens with superb views over Derwentwater. I joined Amanda (Wordsworth House gardener) and a group of gardening volunteers to do some Spring cleaning there in preparation for the new season. I’ve mentioned before the kidnapping of Fletch the perchcrow from Wordsworth House. Well, for some reason, Fletch was in the Millbeck Towers garden and I happened to be there to witness a crack team of gardeners do an SAS type rescue! They had brought with them an attack dog who can only be identified as D. As the kidnapper tried to escape with Fletch, D went in hot pursuit and brought him to the ground and promptly despatched justice. It was a great day all round. Fletch has been freed to go home; the Wordsworth House gardeners had the opportunity to work in a different garden; I really appreciated having such a good team to help me and we completed a lot of work. I had another excuse to go walkabout when I took some of our volunteers up to Wathenlath Tarn in Borrowdale to learn how to hedgelay. This is brilliant experience, sharing skills and knowledge from other Rangers in the Lakes. Back on site and we have a few slacks like this that have become overgrown with wood small-reed which the cattle don't like to eat. This lessens plant diversity in this area. Therefore we invited the boys in from the Western Valleys and the other Rangers from our patch with their brushcutters and got them to work, acting like mechanical cows. Volunteers from Sizergh, including Tom Price the Gardner came and raked the reed off, as well as chopping down some tough hawthorn, and removed it from site. Lets hope after all that hard work the cows will now get in there and stay on top of their munching. With Spring just around the corner, it will be great to see what pops up in its place. 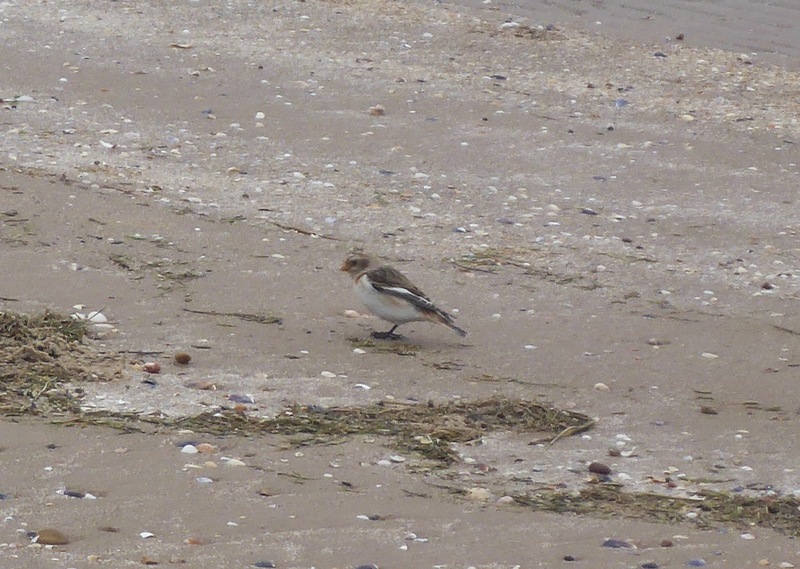 Talking of popping up, we had yet more Snow bunting. The first flock we recorded got up to 21 in number, but since then only 9 have stayed on. So the news you've all been dying to hear is...we've finished the first stage of our boardwalk project. To open it (using loppers and hazard tape) we invited Ann Thurlow, Mayor of Dalton-in-Furness, who we're also honoured to have as one of our volunteers! Whilst I skip off onto the sun, Ranger Dog Bob looks on in sheer embarrassment that I'm his! Just before Easter 8 gardens will open to the public the length of Cumbria 'from Cartmel to Carlisle' to mark the Lake District's link with Wordsworth's 'host of golden daffodils'. Wordsworth left a double legacy to the Lake District - not only his poem 'I Wandered Lonely as a Cloud', but also Dora's Field, which he planted with native daffodils in memory of his daughter. Opening Dora's Field last year was the starting point for all the openings. North Cumbria - High Moss in Portinscale near Keswick, Newton Rigg Campus Gardens & Lowther Castle & Garden Trust near Penrith and Acorn Bank Garden & Watermill in Temple Sowerby near Penrith. The NGS, which celebrates its 87th anniversary this year, organises the opening of almost 4000 gardens in England & Wales. In 2012, by opening their gardens, NGS Garden Owners raised £2.8m benefiting nursing & caring charities and horticultural education in England and Wales. Come and join us at Dora's field Rydal on Sunday 23rd March, enjoy the sea of yellow Daffs and chat to the Rangers about the Fields history and secrets. Planning a project and starting a project. The time is fast approaching when our visitor numbers will increase very quickly so I spent some time last week planning self-guided walks. Leaflets for these walks will be available in the Trust shop on the Derwentwater shore and there will be oak marker posts along the paths for walkers to follow. We see many families with small children for example who walk along to Friars Crag but, if they are new to the area, they are uncertain about whether or how to go further. Where does the path carry on? Will it be too difficult or too far? Does it go along the lake or through the wood? Do we have enough time to do it? The leaflets and the way-markers will answer those questions and hopefully will encourage many more people to go out of their comfort zone to explore, discover and enjoy much more of this beautiful place. The walks will begin at the shop & amphitheatre and will take in Friars Crag, Cockshott Wood and Strandshag Bay and there will also be one at Castlehead. In all there will be four different trails with different levels of difficulty. Soon, we hope, there will be even more to enjoy in Cockshott Wood. We are planning to develop a wild play area for children. We’ll be using natural materials from the wood itself to create this. We have already looked at pictures of similar Trust developments to learn from them and will also hold a couple of sessions to consult with children about what they would like to have. I feel really excited about this project and can’t wait to get started on it. Meanwhile, we have started work on the Braithwaite Common project that I mentioned last week. A sizeable group of village residents turned out last weekend and set to work helping with the clearing of some undergrowth and laying a hedge. As you can see from the photographs, their enthusiasm and sheer hard work achieved a lot in just one day. Che’s been staying with us again. Che’s always staying with us. I think he’s moved in! I quite like it though. I was getting bullied the other day and Che came and stuck up for me. He was great. Shocking news about a perchcrow. I have three exciting things to report this week. I’ll start with the alarming news from Wordsworth House in Cockermouth. If you have been following the blog of Fletch the Perchcrow, you will know that he has been kidnapped and there has been a ransom demand. Fletch is a very friendly chap who allows crows to perch on him so it’s difficult to know why anyone would do this. The ransom demand was originally for cake and coffee but has now escalated to cake, coffee and scones. From my perspective as a ranger, I think the staff at Wordsworth House might have buckled too easily to the demands. Where is this going to end? You can see from these photographs why we are so worried about him. Check for any recent developments at Fletch’s blog. The second thing to report is the beginning of a new project in Braithwaite village. After discussion at a meeting with the Parish Council and a large group of village residents, a plan has been developed to manage Braithwaite Common. There were many views expressed about how best to do this ranging from creating a garden to allowing it to grow naturally into a wild area. We have now arrived at a compromise that will allow villagers to use and enjoy the site but will also encourage diversity of species. Next weekend, I will be working with my regular volunteers and a group of enthusiastic villagers to begin that project. I am hoping I will also be able to involve the village school children in this. An earlier, small project for the common was to plant fruit trees that are there for any villagers to use. This more ambitious stage is likely to be a five year programme so watch this blog for news of how that develops. And finally for now, I’ve been with 24 others to a National Trust training event run by one of the South Lakes rangers. It was a Dark Sky Discovery training session. This is something I have not known much about before now but he was an excellent, very knowledgeable trainer. I am now very keen to develop these ideas especially with children. If only we could guarantee clear skies! Wynlass Beck after a night of heavy rainfall. Blue the Border Collie. He was paddling in here yesterday morning! Wynlass Beck was looking impressive in the morning (7th of March) after a night of heavy rainfall. Wynlass Beck flows through National Trust land at St Catherine's, and close to the straw bale building called The Footprint. Blue decided to forgo his customary paddle in the beck; after some deliberation he considered discretion really was the better part of valour. ...........close to being in full spate. Since our last update we've been busily working away in Dora's Field, at Rydal, just outside Ambleside. Our work was replacing some old slate steps with something that would be easier to walk on, would be in keeping with the garden and would also last indefinitely. We decided we'd use the same technique as we had in High Close gardens at the end of last year. We set to work digging in the large slates to form the front of the step, and filling in the back with smaller pieces of slate. The idea was to get our work completed before the main show of Daffodils started to appear. This would cause the minimum amount of damage to them and give plenty of time for things to settle down before the National Gardens Scheme open day at the end of March (Details of which can be found here... Link). While working there we actually spotted the first Daffodil coming into flower, along with a few Crocuses and lots of Snowdrops. There were still plenty more only just breaking through the soil though, so there should still be plenty in flower if you're planning a visit in the coming few weeks. The work was quite slow going as each stone had to be individually shaped by hand and the levels needed to be regularly checked to make a good surface to walk on. Once all the stonework was completed we filled in the gaps with a dry-mix of sand and cement to add extra strength to the whole path. This was later covered over with some soil to help everything blend in a little better. Once this was all done, it was just a matter of tidying things up, we removed all the surplus stone and levelled off all the soil that had been dug out. 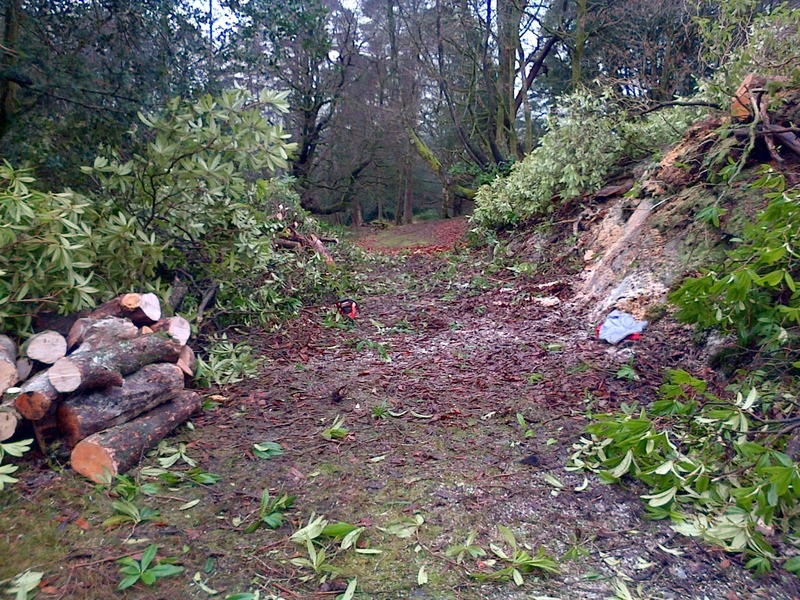 Then finally we removed the tracks we'd created where we'd accessed the site with the power barrow. The whole project took us a little under five weeks to complete. We're planning to return to Dora's Field next year and carry out some similar work on the other side of the path to complete the short circular route. This will make the site more accessible to a wider range of people to come and enjoy Wordsworth's Daffodils each spring. Drystone walls ….. If you spend any time in Cumbria they’ll be a familiar sight and if you spend any time working in conservation they’ll soon become a very familiar sight. They’re called drystone because they have no mortar to hold them together, just a set of rules that are applied to every stone you put on the wall. How fast you do it often comes down to how often you do it – practice makes …. well, let’s say gradually improving …. Try to use the biggest stones at the bottom of the wall, smaller ones higher up. Always place the stones on the wall so their tops are not tipped up, they are level flat. Two on one and one on two – always try to cross the joins by placing the next stone so that it spans the gap between the two stones below it. Try to ensure the outer faces of the stones present as flat a surface as possible. Your wall should be roughly twice the width at the bottom it is at the top. This gives it it’s ‘batter’, or sloping face. We’ve had lots of opportunity to put those rules into practice recently. The Red Nab bridleway runs from a popular car park towards Wray Castle, much of it flanked by a wall. It was starting to look like a very tired wall too and in great need of some TLC, which is where we came in. For the last two years we’ve repaired many sections of it, all with the help of volunteers. We recently had one of our last days there with the local group the South Lakes Conservation Volunteers, putting the cams on a long stretch. For your own sanity, know when to stop ….! Here at Gondola HQ we’re very fortunate to have made some good friends over the years and as with all good friendships we’re never shy in asking for a favour or two. Recently we begged a favour off our good friend Bill, who is skilled in the art of carpentry having worked for many years as a joiner for the National Trust. Bill very kindly volunteered his time to repair one of the capitol boards that sit on the prow of the boat. Those of you with a keen eye will have noticed that the capitol board holds a clue or two about Gondola’s noble connections. Here’s another shot showing the capitol boards in place on the boat, the two halves butting up against each other to form a coat of arms of three white stags heads on a black background together with the motto ‘Cavendo Tutus’ carved into the red ribbon below. If you never got round to completing your I-Spy Book of Heraldry when you were young you might not be aware that this is the coat of arms and motto of the Duke of Devonshire. You can see the motto prominently displayed in gold lettering on the Duke’s home at Chatsworth House below. The 7th Duke of Devonshire was the Chairman of the Furness Railway at the time Gondola was originally built in the late 1850’s which is how the Devonshire coat of arms came to feature on the boat. The family motto, ‘Cavendo Tutus’, roughly translates as ‘safe through caution’. We think this is a rather appropriate motto for a boat that carries members of the public, although it doesn’t seem to hold much sway with our public liability insurers judging by the cost of this year’s renewal! There’s also another hint of the link between Gondola and the Devonshires - on Chatsworth House a number of coiled snakes are carved into the frieze below the roofline. This is echoed on Gondola by the golden sea serpent on its prow. And that’s only part of Gondola’s nobility story as the boat also has a link with another Duke, the Duke of Buccleuch. You can see his coat of arms on Gondola’s stern. The 5th Duke of Buccleuch was also a major shareholder in the Furness Railway, but presumably didn’t have as many shares as the Duke of Devonshire. Loath though I am to compare Gondola to a pantomime horse, it seems that the Duke of Devonshire pulled rank and opted for the front legs!